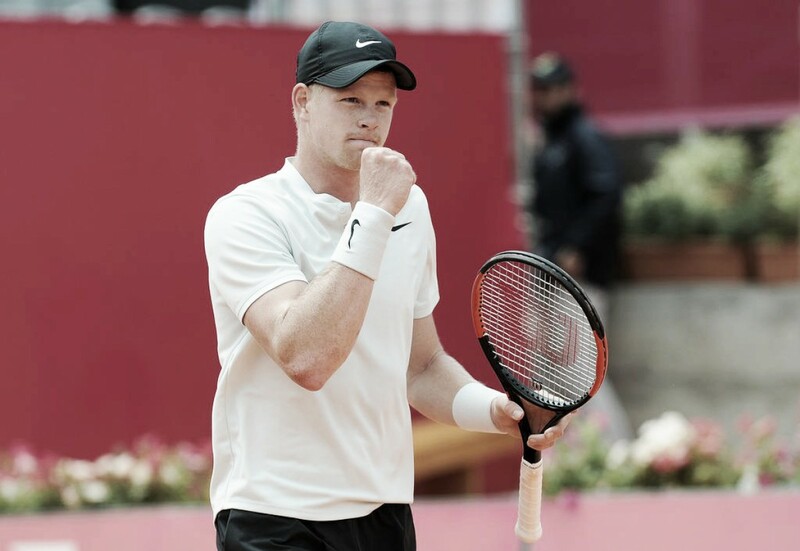 Kyle Edmund is currently ranked 23rd on ATP, a career-high ranking, and we talked a little bit with him about British tennis, his past and his goals for the season. The British athlete won his second round match and will face João Sousa in the quarterfinals. VAVEL (V): You started tennis at 10 years old, it was a little bit late, don't you think? Usually, players start a little bit sooner. Do you feel like you would play better if you started earlier? Kyle Edmund (KE): (Sighs) What a question. I think it is late but, I mean, how can I predict the future? At the minute I'm seating at 23 in the world, I want to go higher. I don't know. I mean, I did a lot of sports when I was younger and I think that helped overall. I had a good eye for sports and hand-eye coordination. When you're ten years old, you don't think about becoming the best things in the world, is just, summing, you enjoyed doing it at ten years old, and I enjoyed playing a lot of sports and obviously, there is a point that if I wanted to take something more serious I'd have to do it sooner rather than later and I guess around 12 or 13 I just had to take tennis full time. V: There is a lot of British tennis players in the rankings but only two in the top 100, you and Andy, maybe Cameron [Norrie] next week, how do you see the state of British tennis right now? KE: It's one of them, obviously hadn't changed too much, is always been very similar to that and like every federation it has its ups and downs but Britain is one of these countries that hasn't always had a lot of players inside the top 100, so that's not unexpected if you compare to France and Spain and America. It's always been a few guys. Andy is injured at the minute, we had Evans before he took his anti-doping ban, so he was there. Bedene, you can count him or not, he switched countries. I'm trying to focus on myself. The other guys, I guess they are trying to work as far as they can and I guess we could measure it as the Davis Cup when we play as a country. The last five, six years, we have done reasonably well so, the Davis Cups are positive for us but of course we would always like more numbers in the top 100 but it doesn't happen overnight. V: Your favorite tournament is Wimbledon, right? And your favorite surface to play is clay, how can you explain that? KE: Well, I like Wimbledon because is in my home country. I have my family and friends and I get to stand in my own place, my home, which is nice. When you travel so many weeks a year it's good to be at home for a little while but I also like playing the US Open, the Australian Open, Indian Wells is a great tournament. I like this stretch of clay courts, I like playing on clay but I've made the semifinals of the Australian Open as well so I like playing on hard too. So it's tough to really say I like one or the other. I just do the best I can. There are lots of good tournaments out there but Wimbledon is probably the most special because it has a lot of history and I'm British. V: Would you rather be world number one or win a Grand Slam? Or you don't have a preference? KE: To win a Grand Slam. V: What are your goals for the rest of the season? Did you set up something with your coach? KE: I would love to win a tour event, I've not won one so I feel I have the capability to win one and I'm getting a little bit closer each time with semis and I reach my first final a couple weeks ago, so yeah that's definitely a goal which would be nice to achieve. I'm seating close to top 20 so there's no reason why it shouldn't be a goal to push inside the top 20 for the first time. There's a couple of goals there but obviously on top of that is the long-term goals and just improve my game which hopefully will improve my ranking.